Keep track of everything in your team. Tasks, todo lists, questions. Ask your team members anything and receive responses quickly. Questions can be private so members can't see each other's responses. team managers can see and change member answers. Organize your team by creating tasks, todo lists and ask your team members to sign up. Video recording, field cleaning, bring the water cooler, take photos. So many tasks, easy to assign. Assign the next game's snacks and refreshments duties in a flash. Create an event specific tracking item and only members on the roster can reply. Who can join a tournament? What is your jersey size? You have any injuries? 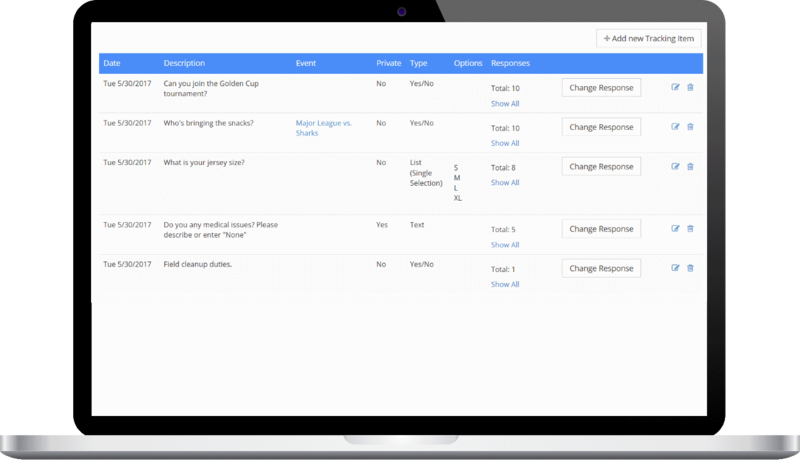 Request answers from your members and restrict their response with a Yes/No, a list of options to choose from eta.